Assessed Risk Ltd provide a simplified guide to the UK’s fire safety laws. All fire safety legislation in England and Wales is currently gathered under ‘The Regulatory Reform (Fire Safety) Order 2005’, which was designed to simplify the existing legal requirements at the time. All premises used for non-domestic purposes, with a few small exceptions, fall under these regulations. Every business must have a designated ‘Responsible Person’ whose job it is to ensure certain duties are carried out within the business, and that actions are taken to both prevent fires from occurring and preventing injury or death in the eventuality that a fire actually occurs. All businesses must have a Fire Risk Assessment. 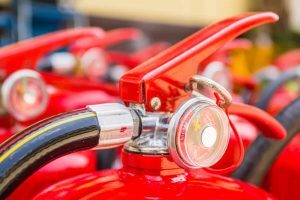 This is the foundation of fire protection in your business and, along with your Fire Safety Log Book, is one of the first things that a fire authority inspecting officer will ask to see if they inspect your premises. Your Fire Risk Assessment doesn’t have to be written down unless you have more than 5 employees, however we would always recommend having it documented for easy reference. 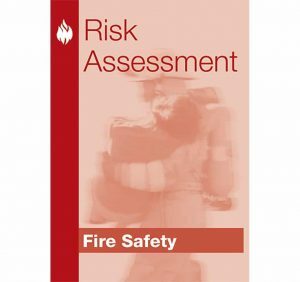 You can read the government’s guidelines on Fire Risk Assessments here. The penalty for not having an appropriate Fire Risk Assessment and suitable fire safety precautions can be prosecution, with severe fines and, if extreme negligence is proven, prison terms. Assessed Risk Ltd have the expertise to assist you with this. UK fire safety legislation states that you must provide “appropriate fire-fighting equipment”. This usually means portable fire extinguishers, but some higher-risk businesses may also need hose reels or sprinklers. An example of a higher-risk business would be a restaurant, or one that needs to store chemicals or flammable materials. Our engineers are BAFE (British Approvals for Fire Equipment) trained and certified. 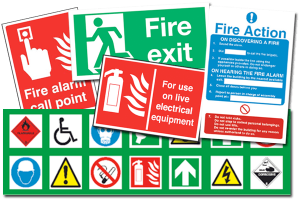 In our experience, fire safety signs are often overlooked by business owners but in fact all businesses will need at least 2 signs (a Fire Action Notice, and an Extinguisher ID sign) and quite probably more, to be legally compliant. – Fire Extinguisher ID sign – explains and locates each type of extinguisher. Mandatory. – Fire alarm call point signs – identifies where to activate the fire alarm. Mandatory if you have an alarm. If you require signage contact us to discuss how we can assist your business. 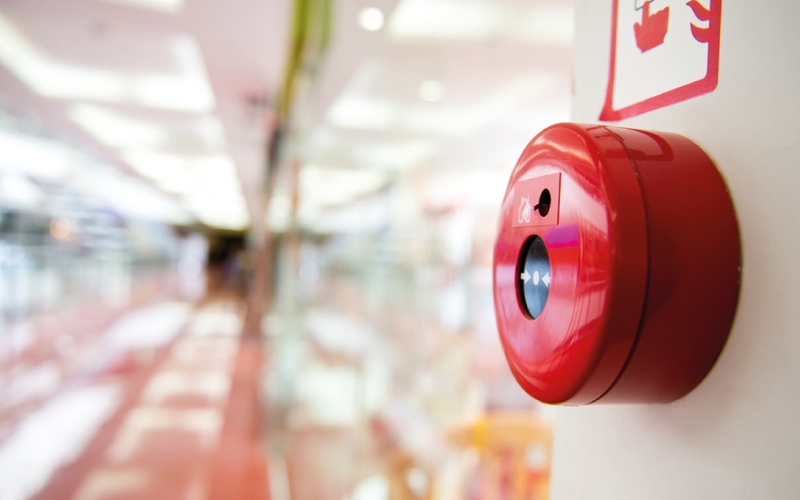 A fire alarm system may not be needed if you are operating your business out of a small premises, such as a shop, where you are able to see a fire developing, and a shout of FIRE would be heard throughout the premises. However some higher-risk businesses, such as restaurants, are recommended to install alarms as an extra safeguard. 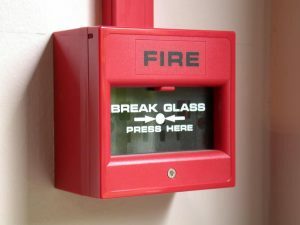 Assessed Risk Ltd can help with the maintenance of your fire alarms and emergency lighting. 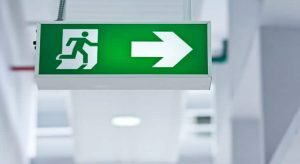 UK fire safety legislation stipulates that emergency lighting is required in buildings for the purpose of providing light if normal lighting fails during a fire. You will require emergency lighting if your building doesn’t have enough ‘borrowed’ light to safely exit the premises in the event of a power cut, or in any ‘danger areas’, such as commercial kitchens or plant rooms. Emergency lighting is also recommended in rooms that are larger than 60 square metres. Your emergency lights should be ‘flick-tested’ monthly (i.e. turned off and on) and undergo a full service once a year. The latest British Standard recommends that you have a 3 hour emergency lighting test once a year, during which your main light circuit should be switched off and your emergency lights left on for a 3 hour period, to test if any fail to work for the full duration. The 3 hour time window is to allow the fire brigade time to work in the event of a fire once all of the building’s occupants have safely evacuated. Because it can be highly disruptive to many businesses to have the main light circuit switched off for 3 hours, an alternative way to test is to carry out a 1 hour emergency lighting test twice a year. Your entire team should know what to do in the event of fire and new employees must be shown what to do when they join your business. We recommend that your Fire Marshals are trained by fire safety professionals and here at Assessed Risk Ltd, this is something we specialise in. All of our instructors are highly qualified with years of experience and have relevant qualifications in Fire, Fire Safety and Teaching. See below a short guide to making your premises safe from fire and further premises guidelines.